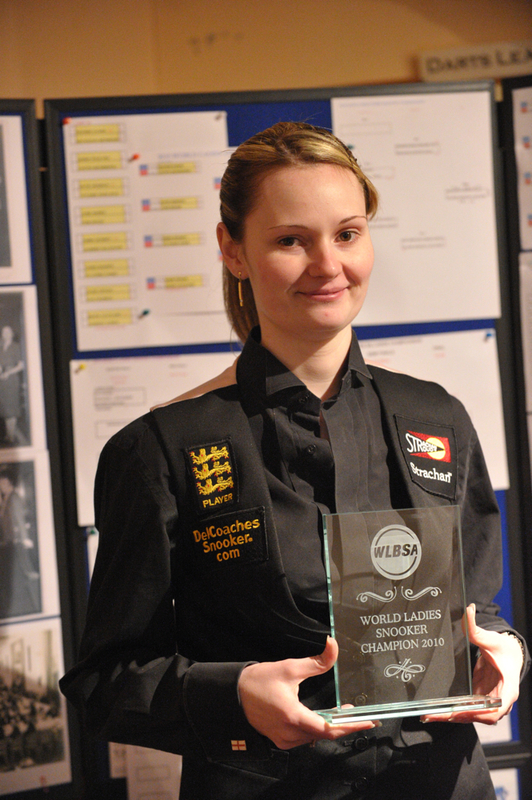 England's Reanne Evans won the World Ladies Snooker Championship for a record sixth straight time. In a repeat of last year's final she beat compatriot Maria Catalano 5-1 to pocket the £1000 winner's cheque. Catalano got £500 as runner up. Katie Henrick and Emma Bonney, both from England, shared third place. Evans also posted the highest break in the event, a 78 in her 4-3 semi-final win over Henrick. 2008 she beat Emma Banks (England) 5-3 and last year she defeated Catalano 5-2. Evans has now won 23 ranking titles and 57 straight matches on the WLBSA tour. No surprise then that she ended the season on top of the WLBSA official rankings. June Banks (England) retained her seniors title by beating countrywoman Eva Palmius 3-1 in the final. 13-year-old Hannah Jones (England) retained the juniors title by defeating Jasmine Bolsover (England) 2-0 in the final. Tatjana Vasiljeva (Latvia) and Maureen Rowland (England) beat Pam Wood and Laura Alves (Ireland) 2-0 in the ladies doubles. Vasiljeva also teamed up with Joe Perry (England) to win the mixed doubles event, beating English pair, Wood and Martin Gould, 3-2 in the final. In the final of the english billiards event two-time defending champion Bonney won by beating Chitra Magimairaj (India) 269-220. 2007 champion Magimairaj also took second last year. This championship is organized by the World Ladies Snooker & Billiards Association. It must not be confused with the IBSF World Championship. Evans has won that event three times. The tournament was played at the Stadium Snooker Club, Hall Green Stadium, Birmingham, England, 3-8 April, 2010.